During the 2012 draft, Dallas Cowboys’ owner general manager Jerry Jones was in a state of euphoria after trading up to draft cornerback Morris Claiborne who was considered the best defensive player in the draft and the best cornerback prospect since Deion sanders in 1989. However, Claiborne’s career has been a disappointment so far and he is on the cusp of being labeled a bust unless his play improves immensely during the 2016 season. Claiborne has had an injury plagued career. He still faces a tough road ahead as he continues to rehab from a ruptured patellar tendon in his left knee suffered last season. Claiborne has also been burned in coverage throughout his career. Part of the reason has been lack of a pass rush which has allowed opposing receivers more time to get open. 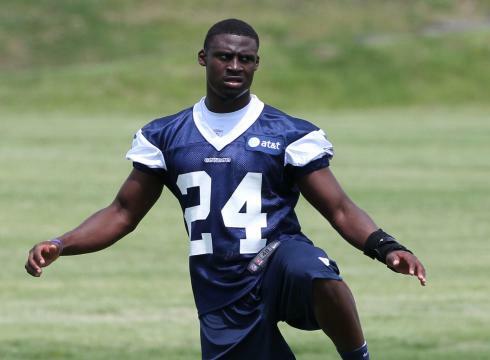 But, Claiborne has also lacked in effort during practice and games. The end result has been a rash of injuries and a total lack of confidence on the field. The Cowboys considered cutting Claiborne outright as he enters the final year of his rookie contract, but the cap hit would be too much and the Cowboys lack depth at the cornerback position. So, the Cowboys have decided to let Claiborne play out the final year of his contract in hopes of him achieving success and demonstrating the skills that made the Cowboys covet him in the first place. I am not saying it will be easy. The Cowboys used their first round pick this year to draft cornerback Byron Jones out of Connecticut. Jones impressed at the NFL Combine in February with his long jump which would have been a world record if it were in a track and field competition. Obviously, Jones is extremely athletic which helps as a corner, but he can also play as a nickel corner against the slot receiver and also played free safety and returned kicks in college. As the Cowboys enter training camp, Orlando Scandrick and Brandon Carr are atop the depth chart at the corner position. That leaves Claiborne and Jones to battle it out for the nickel corner position. I would like to see Jones take over for J.J. Wilcox at the free safety position with Claiborne as the nickel corner. However, who is to say Jones and Claiborne can’t beat out Scandrick and Carr as the starting corners? If Scandrick and Carr struggle, Jones and Claiborne will be waiting in the wings. At any rate, the pass rush should be improved with the signing of Greg Hardy and drafting of Randy Gregory so it is up to Claiborne to show he deserves a long term deal or he will find himself playing for a new team next season.